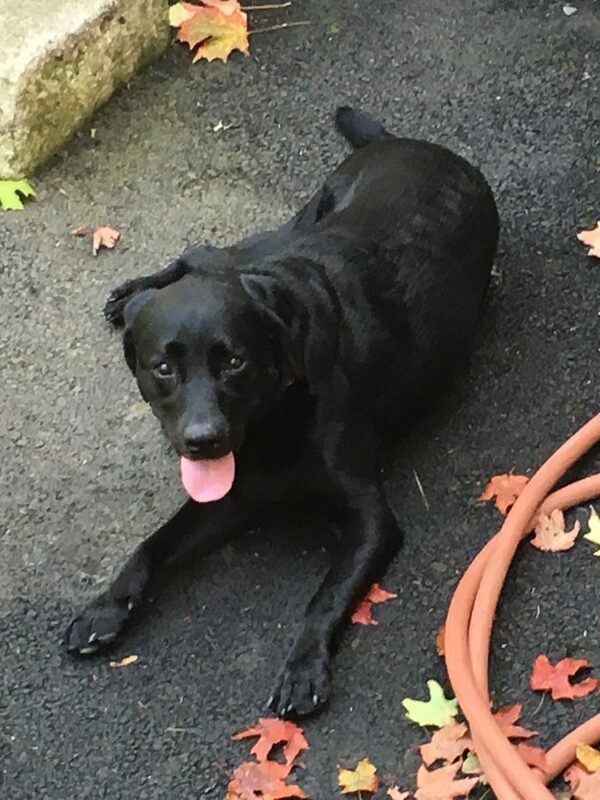 Chances are, you’ve seen an enthusiastic black lab being walked around Dana, her nose constantly sniffing anything and everything; she tugs at her leash, making the man walking her smile. This dog is Stella, and her owner is Doug Corrigan. Well, technically, Doug’s daughter Kelsey owns Stella, but he’s willing to dispute that. 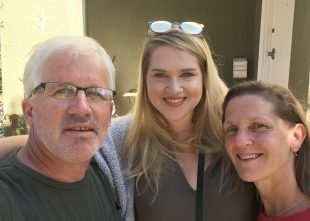 You may have also seen Doug working in the Dining Center, spending time with his wife, Mrs. Corrigan, or you may know their daughter, Kelsey, who graduated from Dana twelve years ago. When I first met Doug, he was surrounded by his laughing and smiling coworkers, indicating how friendly and personable he is. His welcoming personality was further proven when he warmly gave me several Lindt chocolates at the beginning of our interview. I learned that Doug is from right here in Wellesley; he grew up two blocks from Dana Hall. Doug’s dad left his family when he was growing up, and when he was sixteen, his mother asked him and his siblings to get jobs to help support their family. In 1971, when Doug was walking past Dana, he smelled the delicious aroma of food coming from our dining center. He confidently strolled into the dining center and asked one of the men working there at the time, Bill McCarthy, for a job. He’s been working here ever since, and in 2021 he’ll celebrate working at Dana Hall for 50 years! When he first started working here, he said that as the youngest employee he had to do all the dirty work, but by working hard and committing to the job, he worked his way up the ladder to become a night chef by his junior year of high school. Doug managed to successfully juggle school and work at the same time. By day, he attended classes at Johnson and Wales University in Providence, where he studied culinary arts and food management, and at night he would come back to Dana to work. The reason Doug decided to study food was because he loves how he’s able to be innovative and creative. He’s always thinking about new meals to cook, and how to create meals from the leftover food. Whenever there’s fried ravioli in the dining center, it’s because Doug took the leftover ravioli, made a breading for it, coated it, and fried them up. He saves food and money by creating new meals from what we already have. When asked him why he loves Dana and has worked here for nearly fifty years, he said it was because of the atmosphere and the people. He loves the students and the faculty here, calling them his “number one” priority. Doug always knew that he wanted to work with food. He tried retail management, but he always came back to the culinary arts, working at several other restaurants, such as the Pillar House in Newton and and the North Shore Music Theater in Beverly. At the North Shore Music Theater, he was a production chef and cooked food for the guests viewing the performances; that’s when he met Mrs. Corrigan, who worked there as well with her sisters. They were married in 1984, and thirty five years later they’re still best friends. He told me that he fell in love with her because she’s passionate, hardworking, cool, and an overall fun person. Because he’s been here for so long, Doug knows a lot of fun facts about the school–Dana used to have three full time bakers that would bake sliced bread, cookies, pastries, and donuts for the dining center; they once taught him how to make the donuts. Doug also has many more passions in addition to cooking. In 1972, a man who worked at the barn, nicknamed Bathtub Bob for the many baths he took, taught Doug how to play guitar. Doug still plays guitar forty years later, and you can hear him play with the other Dana Hall faculty in the Jug Band. Doug is also an avid car fan. When he was a child, he would sit on the beach in Marshfield with his family, and they would watch all the cars that passed by. This sparked a lifelong love of cars, seen by his weekends spent at a car club in Wellesley, and his restored 1965 Mustang. Doug claims that he can even name any car, old or new. After reading Henry Ford’s autobiography and learning about how Ford’s wife, Clara, was his backbone, Doug named his Mustang Clara. Henry Ford was the founder of the Ford Motor Company, a topic which Doug knows a lot about. When Lee Iacocca, a former president of Ford Motor Company, came to Dana Hall for Grandparents Day, Doug picked him out of the crowd instantly. Doug introduced himself as a fan of Iacocca’s book on saving the Mustang, and even got Iacocca to sign his Mustang’s dashboard- the signature is still there. Doug’s love of cars doesn’t compare, however, to his love of his dog, Stella. Doug has had Stella for eight years, and he describes her as an intelligent, well behaved and patient dog who loves to have fun. She quickly became well established in the Dana community; her love of kicking around soccer balls with her nose is well known. One time, she snuck into a Dana soccer game and stole the ball, making the players to chase her! When I asked Doug if he had anything to tell the Dana community, he said that he absolutely loves working here, and he thinks everyone is perfect in every way- he couldn’t think of a better place to end his career. If you see Doug walking Stella around campus or working in the dining center, make sure you say hi!